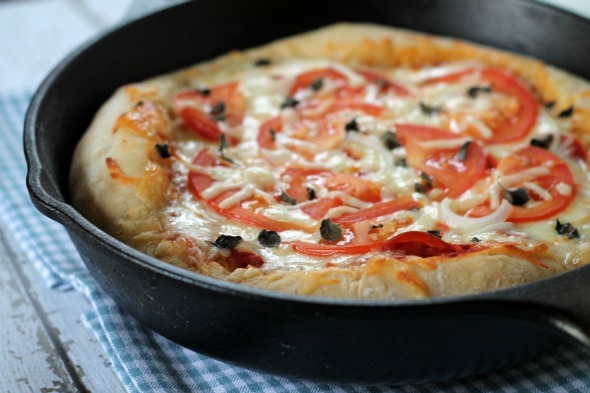 This tasty Deep Dish Beer Crust Pizza is made in a cast iron skillet. 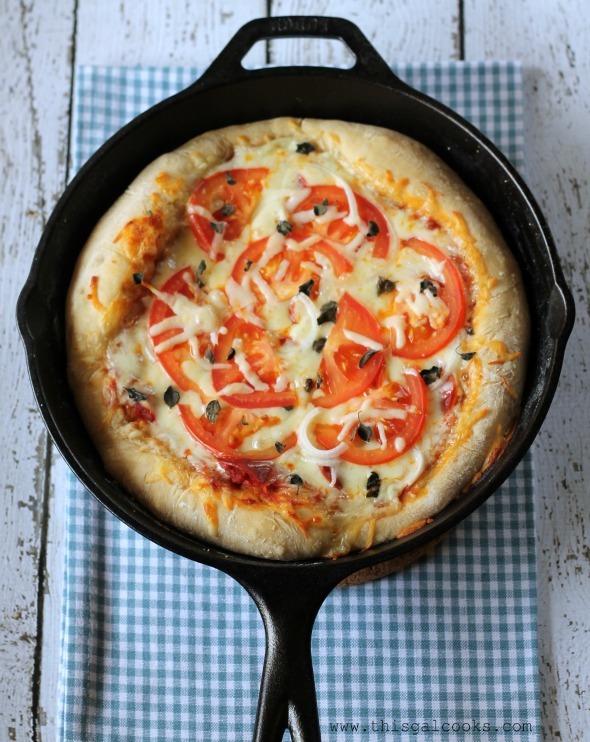 Topped with tomatoes, mozzarella and oregano, it will satisfy any pizza lovers craving! Good Tuesday morning to you! Today is an awesome day. Why is that? Because today is the day of the GYCO recipe reveals! What is GYCO? It’s a bi-monthly recipe challenge hosted by Julie from White Lights on Wednesday and Jen from Four Marrs and One Venus. This round’s secret ingredient is beer, which is one of my favorite beverages to enjoy. What was I going to make for this awesome challenge? Well, I thought of things that beer paired well with when determining the recipe I would make. It wasn’t very difficult to realize that beer pairs well with pizza. It’s pretty much a no brainer. After all, we often have beer with our pizza at our house or when we go out. I had seen recipes online for pizzas made in cast iron skillets and it was definitely something I wanted to try. So I decided to make pizza for my GYCO recipe. But not just any pizza; a deep dish pizza made in a cast iron skillet with a crust infused with beer. I hope you enjoy this recipe! In the bowl of a stand up mixer, combine the flour, salt and sugar. Heat the beer to 115 degrees and add the yeast. Let sit until the mixture is foamy on top. Add the beer, milk and 1 tbsp of olive oil to the flour and combine with the mixers flat attachment. This will only take 20-30 seconds. Remove the flat attachment and add the dough hook. Knead on speed two for 6-8 minutes, adding more flour until the dough is elastic like and barely sticking on the sides of the bowl. Coat hands with all-purpose flour and remove the dough ball from the mixing bowl. Place in a greased bowl and cover and allow to rise for 1-2 hours or until double in size. Coat a cast iron skillet with the remaining olive and lightly dust the bottom of the skillet with the cornmeal. Coat hands and counter with all-purpose flour and roll the dough into a 12 inch circle. You may need to generously coat the dough with all-purpose flour in order to do this as it will be rather sticky. Press the dough into the bottom of the cast iron skillet and form the outer crust by pressing up the sides. Bake the crust at 350 for 10 minutes. Remove from the oven and top with your desired toppings. Return to the 350 degree oven and bake for 25-35 minutes. I love that we both did pizza. It’s a Julie thing apparently. Geez, I’m starving now! – the kids and I eat pizza 4 times a week! Totally making this next time. Deep dish pizza and beer — that’s a Chicago meal! I love how you added beer to your pizza crust. Rick Bayless does the same thing! Pinning! 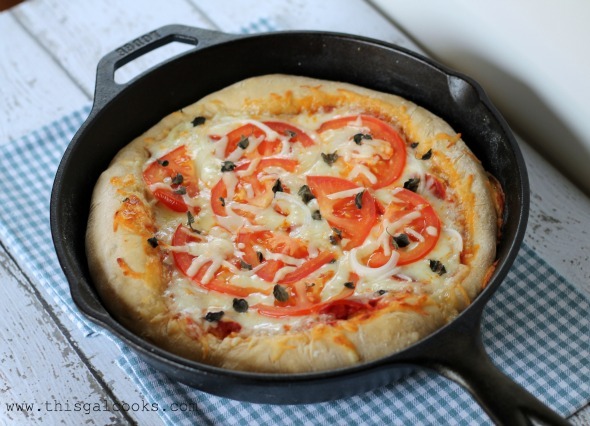 I make pizza all of the time in a small deep skillet because it is the perfect serving size for my boys. I didn’t know beer would work in the dough– will have to try that sometime for myself. Sounds good! I always make my own pizza crust. I’ll have to try your recipe, it sounds delish. Everyone has been so creative with their beer recipes. This is a great challenge. I just made my first skillet pizza last night. I don’t think I will make it any other way from now on! The bottom of the crust was perfectly crisp. Weeeell there goes the diet! Wow this looks so yummy Julie! Missing you guys on this challenge but will catch up on the next one. I am loving all of the links!! Beer in the crust! I know a lot of people who would knock each other over for this pizza! Looks delish! Oh my, that pizza looks absolutely AMAZING. I need that, now!! Yum! I seriously can’t wait to try this! That is gorgeous Julie! Beer in pizza crust – yes please! Yep Yep I want to eat this whole thing! WOW! Thanks for cooking with us girl! I’ve never made pizza dough with beer, but I bet it works like a charm – your pizza looks absolutely delish! WOW! This will be a hit at your next “Superbowl” party! It’s the ultimate “superbowl” party snack ( or appetizers) depending on how you like to serve it, It’s man-ly enough.